Greetings from the Windward Portuguese Water Dog crew! Robin and Rod Burmeister, and Christie and Brian (and Emma and Andrew) Kello, welcome you to our website. We hope you enjoy your journey. 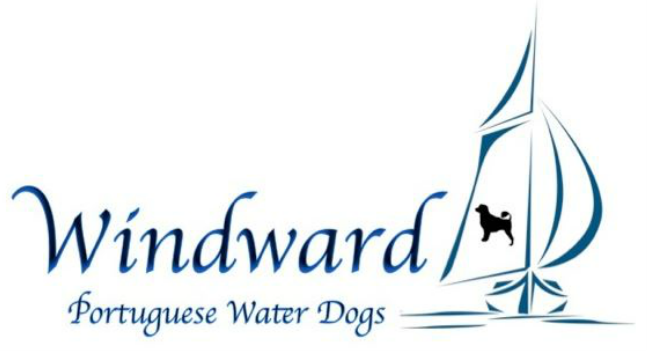 Windward Portuguese Water Dogs was established in the late 1980's and has been home to multiple Best in Show, High in Trial, and multi-titled dogs for over 30 years. Originally based in Petoskey, Michigan, we now reside in on the SW side of Columbus, Ohio. Please browse our site for further information about PWDs. Be sure and click the above buttons for more information (health issues, temperament, grooming, etc.) about PWDs, our biography, and view some photos of puppies and dogs with Windward affiliation. If you are interested in being considered for a Windward PWD puppy (located in central Ohio), please head to our Puppy Information page (under the Puppies tab) for important information. E-mail is the easiest way to contact us with questions. Robin (Zaremba) Lee Burmeister can be reached at windwardpwds@gmail.com and Christie (Zaremba) Kello can be reached at christie.windwardpwds@gmail.com. "Purposefully bred purebred Portuguese Water Dogs brought to you by AKC preservation breeders. We're so proud of what we do for the next generation of the happy, healthy canine family." Below: Salsa (11 weeks) and Wyatt (4 years), taken in late April. PWDs love the water, snow, and anything else we do as long as we all do it together! Above: Salsa (5 months), Blynken (14 months), Rumor (5 years) playing outside.